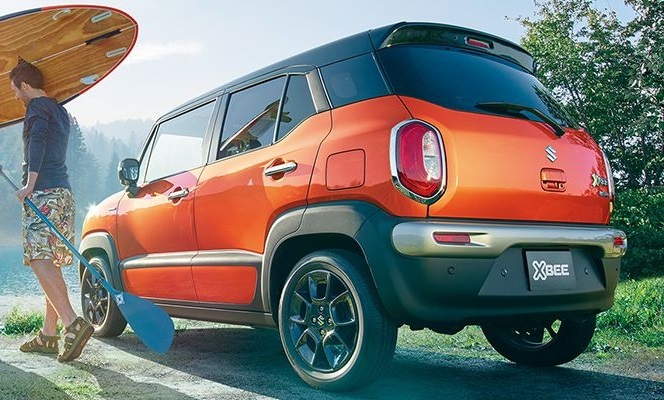 Crossovers seem to be the vogue in the automotive industry of today, outselling their hatchback and sedan siblings by quite a margin. 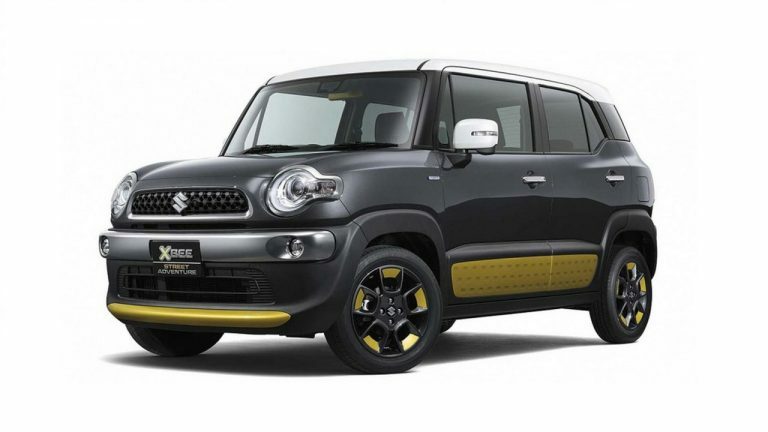 It is perhaps for this reason, Suzuki is pushing the tech envelope with a cute and quirky looking crossover dubbed “X-Bee” (pronounced “Cross-Bee”). With over 2000 units being sold per month in Japan, it would be an understatement to say that Suzuki XBee is doing well. So what makes this kooky crossover such a hit? Let’s take a look at this turbocharged, all-wheel-drive tech-toy and find out. The XBee’s front end is unquestionably cute. 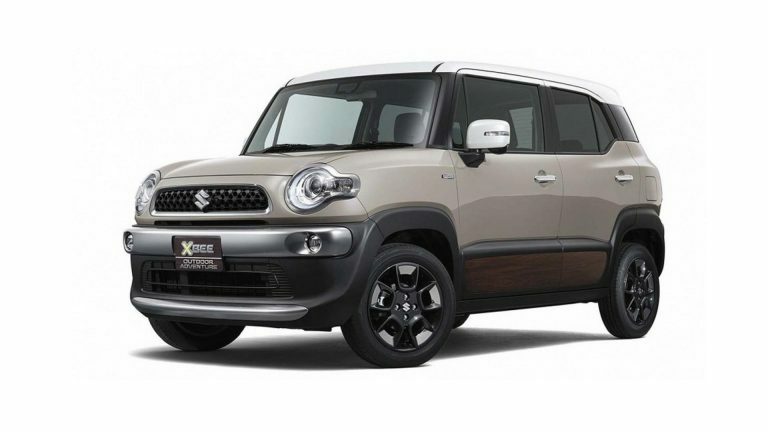 The front end has elements taken from the Mini Cooper (the high mounted circular headlights and contrasting roof) while the handsome lines, broad shoulders, high roofline and spades of ground clearance is reminiscent of vintage Jeeps. The XBee falls in the subcompact crossover category and is about the same size length as a Toyota Vitz or Suzuki Swift, but has a much more imposing road presence and appears bigger in person due to its shape. The two-tone theme, matte-black 16-inch alloy wheels, contrasting roof, circular headlights with LED headlamps, DRLs and fog lamps in the front fender further contribute to the retro aesthetic. The quirky theme continues out back with the oval taillights and black plastic cladding in the rear bumper. Overall, the proportions make the XBee looks like a grown-up Suzuki Hustler, which is not a bad thing. Despite the quirky, retro looks, the design manages to be functional: The boxy profile allows for an impressive interior room though it does impede on the car’s aerodynamic performance. The quirky theme continues inside, though this time it takes a high-tech appearance. The two-tone dashboard houses an 8-inch LCD infotainment display, the climate control panel, infotainment controls, hazard light switch and the gear lever are mounted in chrome trim which livens up the interior. The build quality, like most JDMs, is top notch. All the buttons and switchgear feel high quality and the surfaces you touch feel solid and well built. The instrument panel is suitably retro-styled and features a 3.5-inch multi-information display. For an extra touch of quirkiness, the seats feature coloured accents and stitching and are comfortable, soft and supportive. Interior storage is also a strong point courtesy of a large glovebox, a plethora of cubby spaces and plenty of cupholders. There is a ton of leg and headroom, so the XBee’s quirk does not impair its practicality. The high tech theme continues under the hood. The XBee houses the same 1.0L turbocharged, direct-injection K-series Inline-3 BoosterJet engine as the Suzuki Baleno we took a look at a few weeks ago. The engine has been de-tuned to 99 HP and 150 Nm of torque. On paper, this may seem like a downgrade, but now (due to lower turbo boost and compression) the engine drinks regular (92 RON) fuel, unlike the Baleno which requires premium (95 RON) fuel. This engine is mated to a 6-Speed automatic transmission and is joined by an electric motor that contributes a further 3 HP and 50 Nm to the mild hybrid system. The performance of this unit is remarkable given its small displacement, the instant torque from the electric motor works wonders for lower speeds as it improves throttle response and the engine has enough oomph for overtaking even at highway speeds. The XBee can optionally be had with AWD (All Wheel Drive), which improves traction in challenging conditions, it even features crawling modes for Rock, Dirt and Snow. So you can even use it as an inexpensive, compact off-roader! 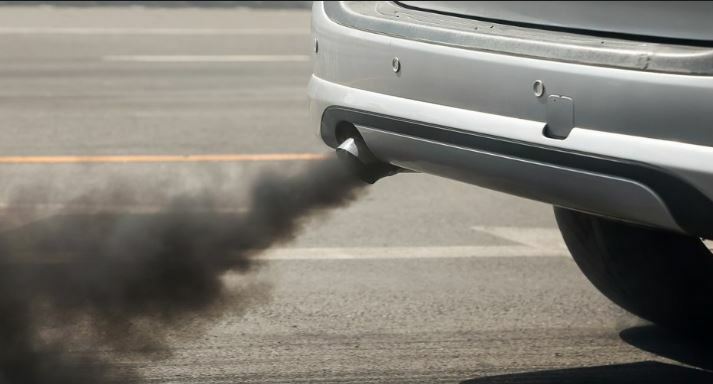 The modern fuel-saving technology present here, e.g. 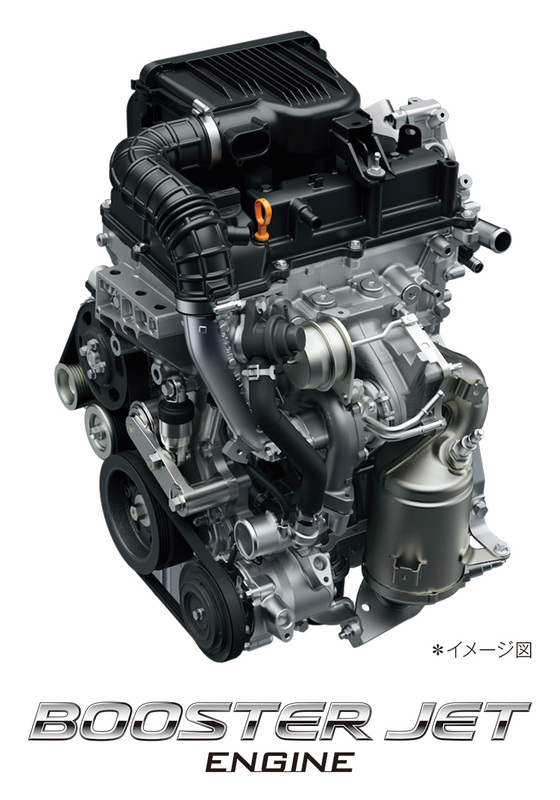 turbocharging, direct-injection, a small displacement engine and a mild hybrid system allow Suzuki to claim a fuel economy of 22 km/l on the JC08 testing cycle. The XBee performs admirably on this front as well, all the modern automotive hits are present here: led headlamps, 16-inch alloy wheels, adaptive cruise control, LED headlights, leather-wrapped steering wheel, an 8-inch LCD infotainment display with Apple Carplay, a 3.5-inch LCD multi-information display in the instrument panel, keyless entry, 360-degree view parking camera, digital climate control, paddle shifters and steering wheel mounted controls are all included as standard on the base “MX” trim! 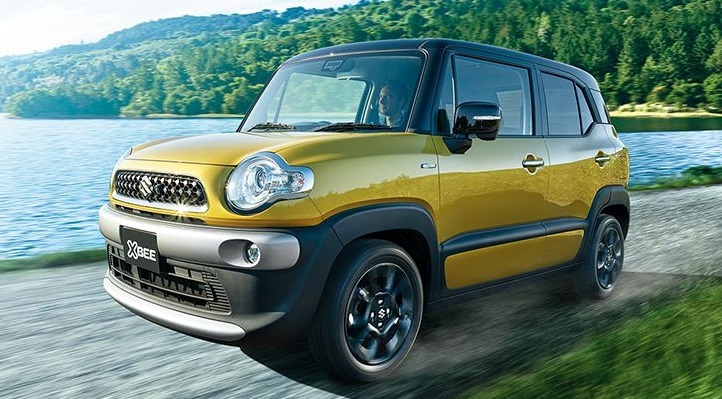 Top of the line “MZ” trim adds leather seats, leather stitching on the gear lever, two-tone exterior design and LED fog lamps. Safety features are also impressive; they include Autonomous Emergency Braking, Lane Departure Prevention, ABS, Traction Control and six airbags including dual front airbags, side curtain airbags, driver and passenger side airbags. The suspension features McPherson struts up front and a torsion beam in the rear, the setup is tuned to be a balance between comfortable and sporty and does a decent job at both. The low-end torque of the engine combined with the instant torque from the electric motor results in a car that feels sprightly. The XBee is reasonably fun to drive, but the high centre of gravity and relatively skinny tires mean that there is a limit to that as well. The XBee’s story is bittersweet when it comes to this front. Since the XBee is currently exclusive to the Japanese market, the only way to get one is from the JDM auctions. The XBee was released in December of 2017. As a result, there has been very little depreciation in price so the model year 2017 Suzuki XBee Hybrid “MZ” with all the bells and whistles and under 5000 km on the clock will set you back around PKR 20-22 lacs. Which is on the pricier side for a car of this class, though it still isn’t a bad value. And this is despite the XBee attracting minimal customs duty due to the small 1.0L (1000cc) engine and being a hybrid. So if you’re in the market for one, I would suggest you wait a little while for it to depreciate, drop in price and become a better value. Unfortunately there no XBees listed for on PakWheels at the moment, but that is understandable due to it being so new. So it is entirely possible that we may see some here down the road. In conclusion, the XBee is a great car with a lot of market legs due to the quirky retro looks, the waft of available tech and amenities. Remarkable performance and efficiency is also a strong point, and the sales figures in Japan certainly reflect that. The relatively high price and virtually zero local support are huge turnoffs for many, but that was the case for many other imported vehicles (like the Toyota Prius) when they were first introduced in the Pakistani market, but now parts availability is no longer a concern for them, the XBee is definitely a car to look out for! As always, stay tuned to PakWheels for more great content and feel free to leave your thoughts in the comments below. Automotive Journalist at PakWheels. Loves Talking and Writing about Cutting-Edge Cars and Modern Technology. Former Student of Bahria College. Resident EV-Guru.